Today we're excited to chat with Melissa Ostrom author of Unleaving. Read on for more about Melissa, an interview, plus an giveaway! Melissa Ostrom is the author of The Beloved Wild. She teaches English literature at Genesee Community College in Batavia, New York. 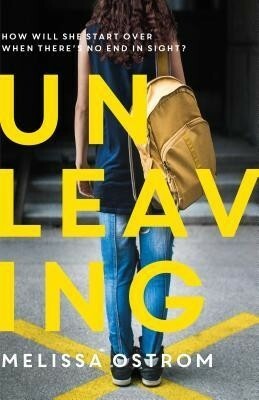 News stories, discussions with my students, poignant books, personal experiences: these all inspired UNLEAVING. In the last few years, especially, I’ve spent a lot of time thinking about the fraught subjects of sexual assault and trauma. Feeling sad about them. Writing the novel gave me a productive way to muddle through those thoughts and feelings. I decided to explore the aftermath of this kind of horrific event and show how complicated the recovery can be, how ugly forces in society can hinder the healing, but how good friends can help. Probably Wren, Maggie’s aunt. A talented sculptor, Wren is prickly, passionate, wry, and generous. Though struggling with her own demons, she stays strong for Maggie. Also, since I’m a potter, it was fun creating a character who works with clay. I’ve admired this wistful poem for a long time. It deals with loss, grief, and growing up, all of which Maggie in UNLEAVING faces, too. If a fairy godmother showed up and offered me the chance to be whatever I wanted, I’d say, “Thanks but no thanks. I’m good.” I love being a writer. This profession: it really is a dream come true. That being said, I have learned (am still learning, actually) that it’s a job that requires some armor and bounce. A good way to describe success in writing—not just for me but for EVERY writer? Hard-won. I try to turn the stinging stuff like rejection into something productive, a fuel for working more intently and getting better. I try. It’s totally different from the cover of my other novel, and this appeals to me. THE BELOVED WILD is historical YA, and the gorgeous, dreamy cover illustration captures the story’s long-ago-ness. The cover of UNLEAVING, on the other hand, is stark, real, and now. I like that the figure representing my main character is captured from behind. In the novel, Maggie has a difficult time moving forward. The past is always hard on her heels, following her, tripping her up. The direction from which the photo was taken reinforces that haunting quality. At one point, Maggie has to find her friend Linnie who’s stranded at an off-campus party. The situation fills Maggie with dread and triggers a flashback. It echoes—in setting and circumstance—a previous party: the time when she was sexually assaulted. This was a difficult scene to write. Linnie was tough. She is tough…and complex. There are people in my life who are like Linnie—hurting and struggling with addiction and depression; sometimes amazingly fierce, driven, loving, and talented; other times, hopeless, consumed, absent, and frustrating. I would take drafting over revising any day, though I know they’re equally important. When revising overwhelms me and I can’t see a way through a narrative mess, I turn to my writerly friends, in particular my wonderful literary agent Rebecca Stead, my excellent editor Liz Szabla, and my faithful writing pal Amber Christopher-Buscemi. I don’t know what I’d do without these talented wordsmiths. Their constructive criticism lets me see a draft with fresh eyes—with their (superhuman!) vision. When they point out issues or offer advice, even if their feedback requires extensive revision (like add-new-characters-and-switch-the-point-of-view changes), I listen closely, say thank you, and get to work. Their suggestions are gifts. I’ve become a better writer, thanks to them. I’m revising a MG novel. It’s about fifteen-year-old Molly Knack who lives with her grandma at Five Corners Inn in Homer, New York. Molly has a lot on her plate from the get-go, including estranged family members, the loss of her best friend, and a community on edge after an averted school shooting. Homer High’s new antibullying friendship initiative, plus a blizzard, her demon-possessed cat, a school-project-from-hell, and a ghost, all seem destined to make her life worse, until somehow, remarkably (and possibly with the help of magic muffins? ), they…don’t. Victim-blaming seems to be the all-American sport. Ugh. We need more books that help young people cope with sexual assault. The cover is eye-catching. The synopsis is very interesting. Sounds like a dramatic and thought-provoking read. As a Victim advocate this hits home for me. I wish people realize victim blaming is so wrong and stops some many victims from reporting the crimes. This book sounds intense and timely. I’m not really drawn to the cover. I prefer illustrations to photographs on covers but I’m very drawn to the description of the book. The cover is sad/lonely and perfect for this emotional and important novel that is unfortunately much too relevant to today's society.